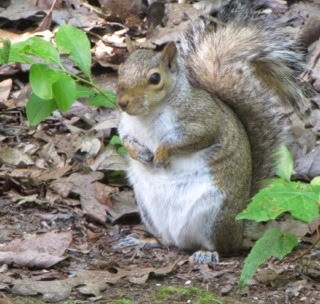 Okay, Who Said I'm a Bit Chubby? Another holiday weekend coming up. I remember Fourth of July as a special time because of the fireworks. We never cooked out, but we would always go where ever we could see fireworks. They were magical to me as a child. As was anything outdoors. Teaching your children to love nature is a terrific experience for the whole family. As each new member learns something else, it is shared and the knowledge base grows and grows. You might have a wildlife garden where you can discover new things on a daily basis. Visiting nature centers that have classes and trail walks is a great way to instill a broader base of knowledge. Camping out in a state park, or renting a cabin, will give your entire family plenty of time to discover the wonders of nature. What somebody loves, they will want to protect so it's an important foundation for children who may become our future naturalists, environmentalists, scientists or the many possibilities connected to preserving the world of wonder that God created for our enjoyment. On the topic of Creation which related to the environment ... there's some new findings. NASA and NOAA Now, in what might be the largest scientific fraud ever uncovered, NASA and the NOAA were caught altering historical temperature data in a political attempt to rewrite history and claim global warming is causing USA temperatures to move upward, when in reality the data shows we're in a cooling trend. (See charts and read more in the article at the Real Science website. One night I stayed up to read and have some Jesus time and I heard something hitting the window. Not an unusual sound since we have June Bugs now and the moths are also doing that, but it wasn't a June Bug sound and it would've been a huge moth if it was that. So It got me interested. The window in there is one of the really tall ones since it has a cathedral ceiling so it has a half-round window at the top. When I got close enough I was so excited to find out that it was a Little Brown Bat. I could see his face and cute beady eyes and those widespread wings. He was trying to reach the light that he saw through the window which was directly ahead of where he kept bumping the glass. What a late night blessing to have seen that. We have a bat box up since we moved in, but no bats have ever roosted in it. I found out pretty quickly that the main bat in this area is the Little Brown Bat and they like to roost in trees. Bats are the only mammal that can fly. Virginia has 17 of the 1,000 bat species in the world. This is one of the most abundant insectivorous bats in Virginia. 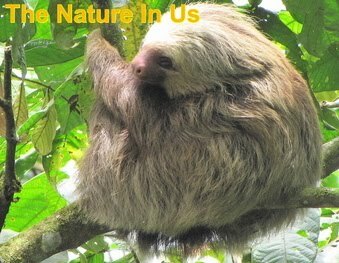 They are found in all forested regions. 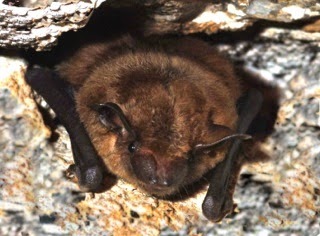 The Little Brown Bat, along with the Big Brown Bat, are the species most likely to be seen in Virginia. We see them at dusk flying about. They forage about 10-20 feet over trees, lawns, water and pastures and may sweep down to get a drink from a water source. We consider it a big blessing to have them in our habitat eating mosquitos since they can eat up to 3,000 insects a night. An adult averages 3-1/2 inches long and wingspread is 8-1/2 to 10-1/2 inches which matches up with what I saw. I know many people have grown up with a fear of bats because of lack of knowledge. So many would say this cute little guy is absolutely ugly. Well ... I guess there are others who say the same thing about spiders. It's amazing how many people now have a fear of spiders after the movie, Arachnophobia. But my next "cute little guy" is a spider but you sure can't tell it. I was sitting on the front porch while Randal was scrubbing down the rails and posts and over where the rail ended there was a bug on the inside portion of the top rail. It wasn't even a 1/2-inch wide but looked quite unusual to me, so I thought the camera could get a macro and we could see what it was. 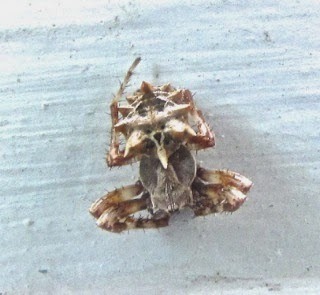 I've taken photos of these types of spiders before. They look like they've got armor on their heads with eyes peering out at whatever is above them. Maybe this is where we got the idea that mothers have eyes in the back of their heads. God's creativity in His Creation is simply amazing and especially when it comes to man and woman. He called everything else "good" but He called us "very good." One of the greatest differences between the Old Testament believer and the New Testament believer is the fact that we as New Testament saints are now the temple of God. The God of the Universe dwells in us, not in a building made of brick and wood, but within the very spirits of those who make Jesus their Lord (Romans 10:9). We must have a revelation of this within our hearts and mind. If we had a real heart understanding of Christ in us and what He has done for us (Col. 1:27), our lives would be so different. Our actions and reactions to our circumstances would be far from what we see of the unsaved which is for the most part no different than the saved. You are the ultimate of God’s creation. He made an entire universe for us to enjoy and gave us promises that are received simply by believing ... but believing doesn't come simply if we don't understand and KNOW the love of God. We were created for relationship so when we connect to God on an intimate level, we connect to all that He has provided for us before the foundation of the world. 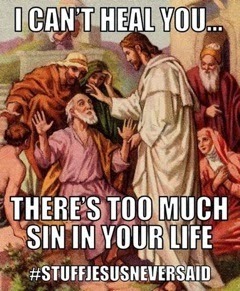 The problem is that we've been told our sin comes between us and God. Jesus healed ALL who were oppressed of the devil, sickness is NOT of God. Sickness is a result of the satan who seeks to destroy mankind spiritually, physically, and emotionally. Praise God Jesus Heals, for "He is the same yesterday, today, and forever" (Heb. 13:8). "And all things are of God, who has reconciled us to Himself by Jesus Christ, and has given to us the ministry of reconciliation; To wit, that God was in Christ, reconciling the world to Himself, not imputing their trespasses to them; and has committed to us the word of reconciliation." The dictionary states that to reconcile means “to reestablish a close relationship between; to settle or resolve” (American Heritage Dictionary). God does the reconciling, and man is the one who is reconciled. The English word “reconciliation” was translated from the Greek word “katallage,” and this Greek word means “exchange (figuratively, adjustment), i.e. restoration to (the divine) favor” (Strong’s Concordance). God took our sins and gave us His righteousness. What an exchange! Some people can’t accept this because they know themselves and see the bad things they've done. They know their thoughts. But in your spirit, if you are born again, you have been reconciled to God. Whatever God’s Spirit is like is what your born-again spirit is like. Praise the Lord! Our spirits are reconciled to God, and now we have to reconcile our minds to what the Word says about our spirits. The way God was able to reconcile us to Himself is that He didn’t impute our sins unto us. 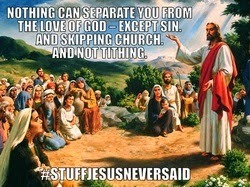 He imputed our sins unto Jesus (Romans 4:22). The payment for sin had to be paid and the Father sent Jesus to pay for the sins of the whole world (I John 2:2). Just like He created the trees and plants to reproduce on their own, gave the earth the right air mix for them and us, had all the details in place for us to live and for life to go on. He's not creating trees after each one dies. He considered all our needs from healing to finances and provided for them. We get hung up thinking our sin keeps us from God. If so what was the benefit of Jesus' payment on the Cross? Our attitudes would change towards ourselves (condemnation) and others (judging) if we understood how important we are to God. If we understood the meaning of the Cross, The Power of the Cross, we would begin to see how God looks upon us. In the New Testament, He chose the name Father for us to relate to Him. What a term of endearment, and actually it's Abba, Father. Abba means Daddy. All of our emotions could be comforted by the reality of Christ's love for us. So much love that no matter what happens we can run into His arms and be totally comforted. Connect to this reality of who you are through this audio entitled, Valuable You, by Clint Byars.